If you love colonial architecture, as I do, there’s a little city in Ecuador that will speak to you. Located in the heart of the Cuxibamba Valley, Loja has two major universities, a law school, and assorted arts and technical institutes. It has a young, vibrant flavor. People are friendly. And they’re happy here. Loja has about 180,000 people in the south of the country. There are four main plazas surrounded by block after square block of massive and majestic adobe buildings, with equally massive windows and arched doorways where horse-drawn carriages once entered. Some feature wide wooden balconies supported by huge stone columns. Others feature ornate exterior tile work and giant shuttered windows flung open to catch a welcome breeze. These four main plazas each have an anchor church, filled with historic artwork meant to stir adulation or fear…or perhaps both… into the hearts of 16th-century Ecuadorians the Spanish hoped to convert to Catholicism. 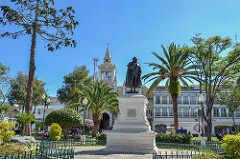 The plazas, too, (and several smaller shady parks) in the heart of Centro boast their own unique statues, frescoes, and attractions. Several days can be spent exploring the historic center and you still won’t see it all. My favorite city street, though, has to be Calle Lourdes. A giant metal archway engraved with the words “Nuestra Señora de Lourdes” beckons visitors to explore this Old World cobblestone street, lined with ancient buildings painted in rainbow shades of blue, orange, turquoise, gold, and pink. You’ll find bars, restaurants, and all types of artisan shops here. At 75 cents each, be sure to try the tamales lojano…luscious corn-meal tamales that this town is famous for, stuffed with pork, chicken, cheese, and more. So why isn’t the colonial town of Loja as popular with expat retirees as is Cuenca, about three hours farther north along the Pan-American highway? Honestly, I’ve no idea. 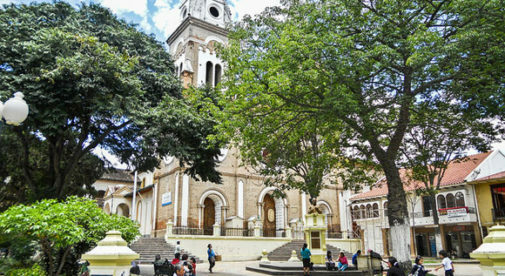 The colonial town of Loja can be compared to the expat haven of Cuenca, but has yet to be discovered by the mainstream. To add more feathers in its cap, the cost of living is extremely affordable. While expat couples can live comfortably in Cuenca on $1,700 a month, including rent, I’d guess you could shave a few hundred dollars off that budget, where rentals, certainly, cost less. The climate, too, is more appealing to some than the cooler and often rainy days you’ll find in Cuenca. At a lower elevation of 6,750 feet above sea level (as compared to Cuenca’s 8,200 feet), this place offers a sunnier, warmer climate…average daytime temperatures are in the mid-70s every day of the year. So let me ask again: why has Loja been, for the most part, overlooked on the retiree trail? Still no idea. But I predict that will soon change.